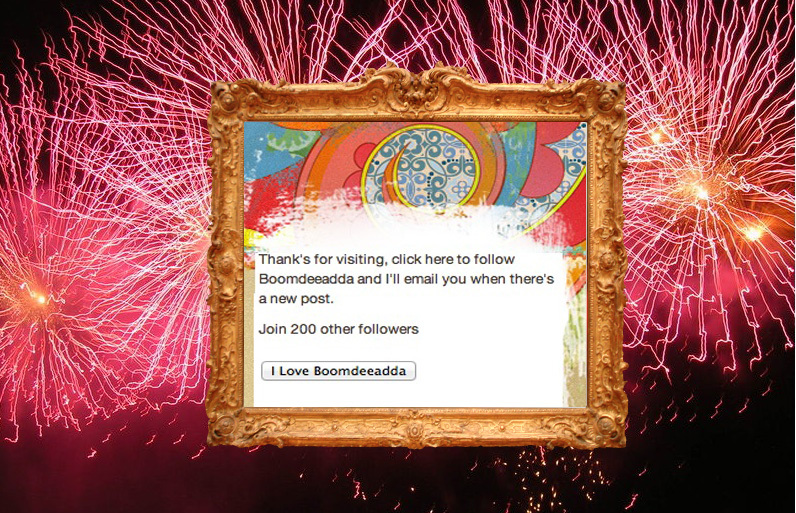 I started this ‘ little project’ last week in anticipation of Boomdeeadda reaching 200 Followers. Que the fireworks! Mr B even took me out for supper to celebrate. 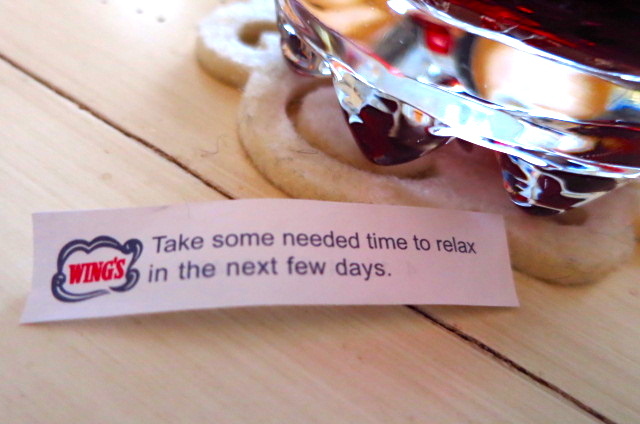 I got this funny fortune in a cookie and we laughed and laughed because……well really, I’m a pampered retired princess, LOL. 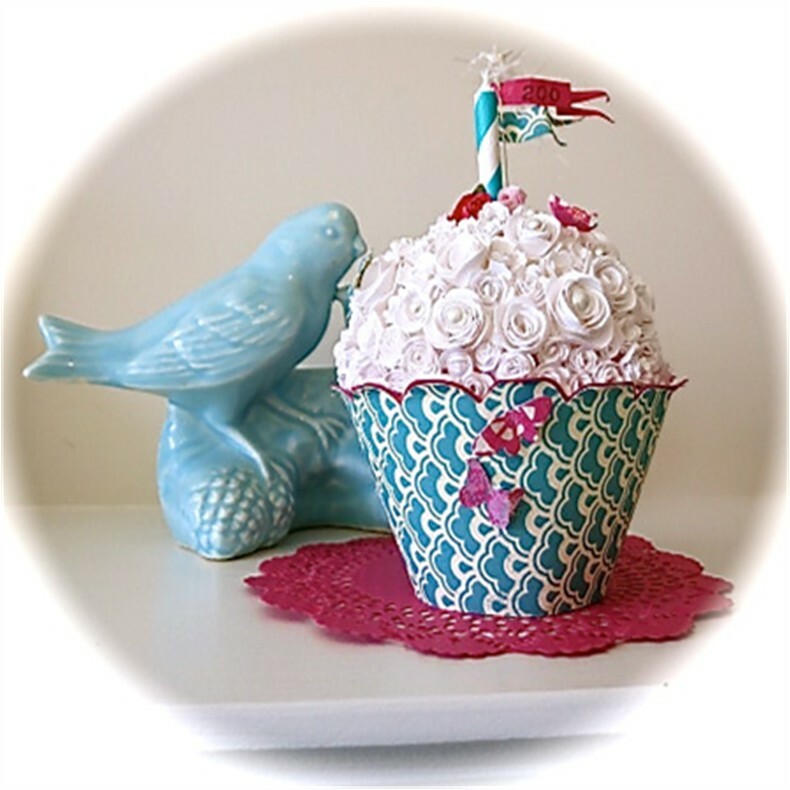 The cupcake bottom is a die cut as are all the many mini roses. It was a pretty easy, all be it, mind numbing project. I used half of a styrofoam ball for the top. I’m overjoyed with how it turned out, all iced in white roses. 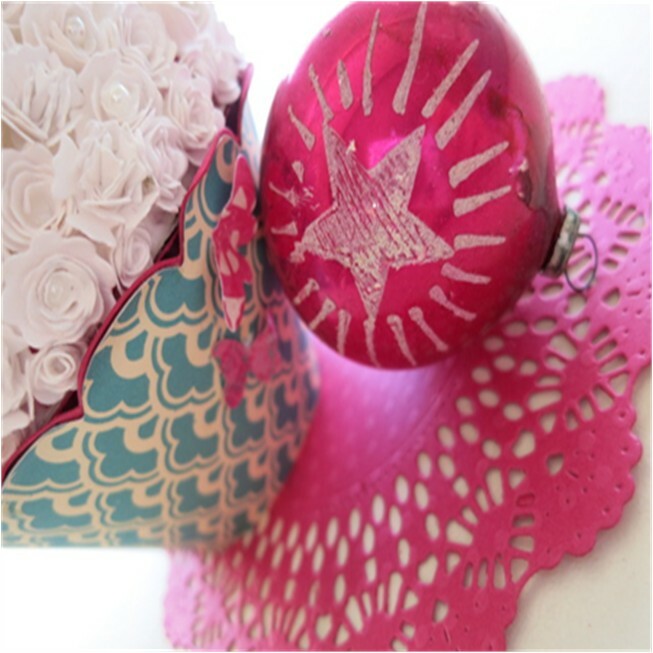 The pretty pink doily and butterflies are also die cuts. Kidding aside, thank you everyone for your amazing support and generous messages along the way and for sharing your art, crafts, travels and wisdom with me too. I’m having the best time, thank you for helping me reach this milestone. You really make me shine! This ‘one-of-a-kind, never to be done again’ confection of loveliness is off to one of my ‘Craft It Forward’ friends. Enjoy! Who knew blogging would be so delicious and yet, calorie free! So, what’s your favourite cupcake? That’s wonderful! What a lovely little birthday gift that would be! Such a big kid to get glue in her hair!! hahahha. Congratulations on your milestone by the way. It’s obvious that you’re having fun!! 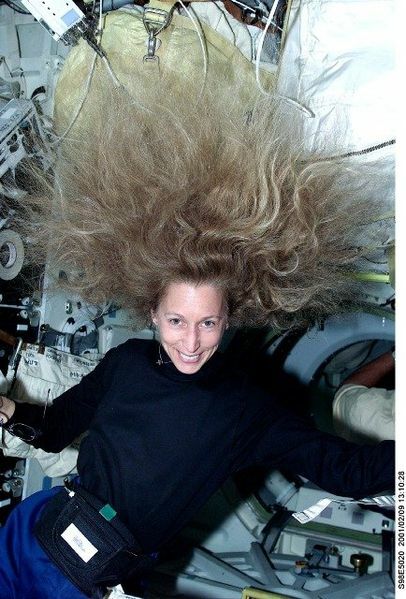 Lets just say I was thinking of a haircut and that was the clincher….LOL…I’m a certified hazard. I’m still blown away by all the great support. It’s been a totally awesome year with so many great connections. I’m now looking forward to a trip to see Alys and WOW, who’d have thought that could transpire from blogging? I’m having the time of my life, true that. Thanks for all your visits Sunshine, I was out all day and it’s so nice to see your smiling face here as I relax with my glass of wine…Cheers! 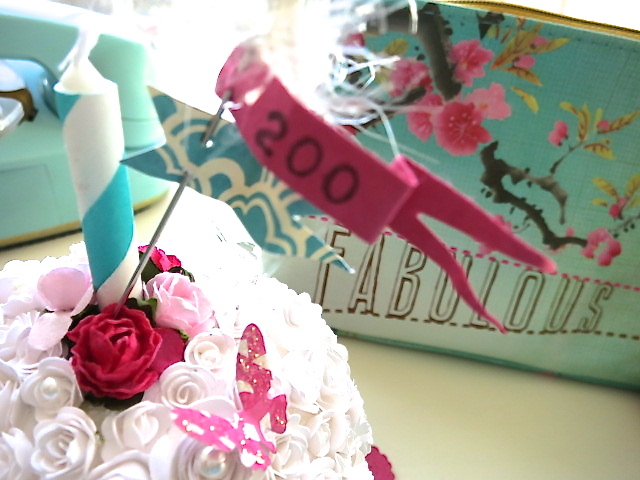 Congrats on 200 followers, that is so wonderful! 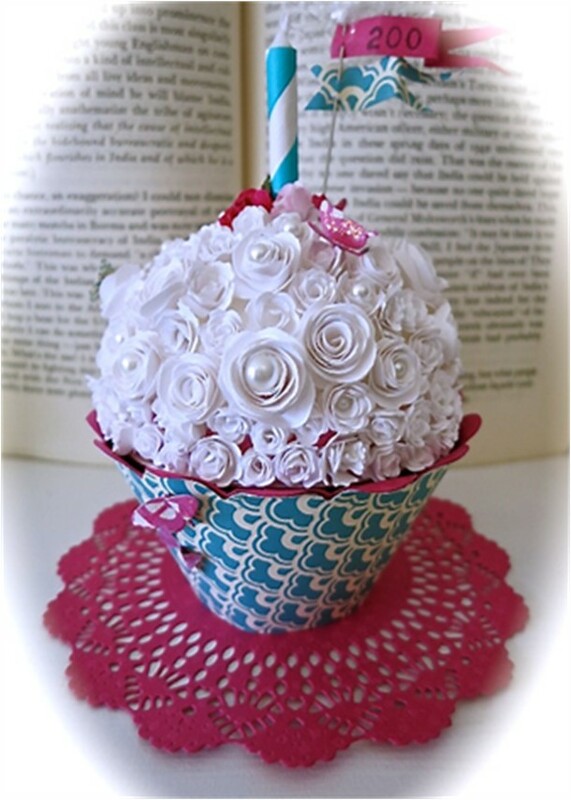 🙂 Your paper cupcake is delectably gorgeous! How fun! Thank you so much Sheryl. I’m sure it’s a one of a kind, I’m brain-hatching another option for cupcake top. I think it might be fun to make a planter cupcake, like a round chicken wire ball filled with dirt and moss….mmmmm more work required on that thought. Almost time to think about the outdoors, hippy! 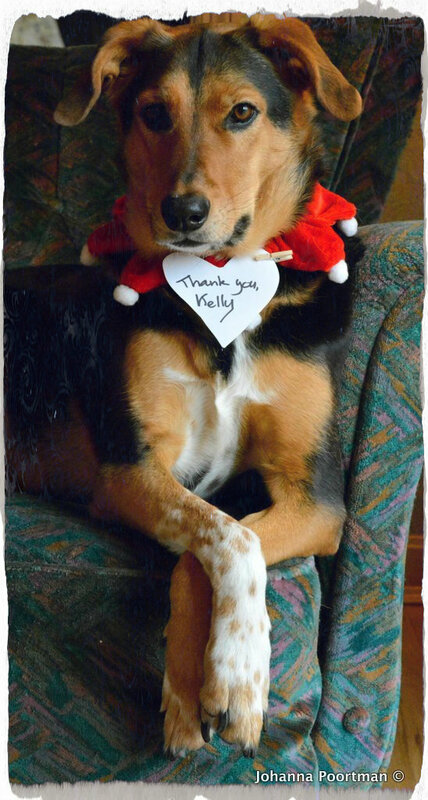 Hi PJ, thank you for the cheer and all your visits too. The saving grace in the whole project was it’s for a friend to Boomdeeadda. It was nice and sunny last week, I could crack the window and enjoy the birds singing in our trees & Petals and Blossum were on their pink pillow, sleeping all day. Add the iPod and it’s a pretty glorious place to hang out really 😀 Tons of hugs to you! I am almost tempted to unfollow you and then re-follow… just so that you can go through the bliss all over again… and so that I can be your magical 200th follower too harhar! Wow, look at all the love on this thread! Congratulations, Boomdee. So happy and proud to know you. Well done, well done. I L.O.V.E. love that cupcake (no calories, either). You inspire me every day. 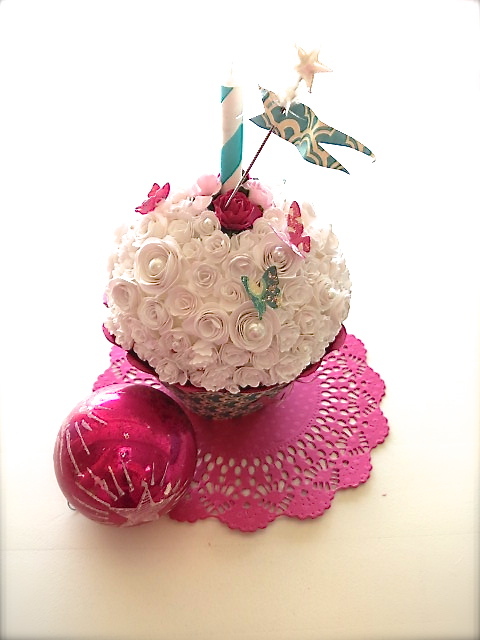 I’m hoping you’ll do a tutorial on the amazing paper confection. It’s stunning. It must have taken hours and hours and hours to make. Awww thank you ((( Alys ))), I remember how excited I was at 14 follows, now WOW, I’m blown away by everyones generous messages and what it’s brought to my life…namely your friendship. Congratulations on 200! How did the roses come from a die cut? Is it something that you roll up after it is cut? Beautiful! Congratulations on reaching two hundred. I recently hit the same milestone, but was too busy with other posts to note it. When you travel it is sometimes hard to squeeze in milestone posts :-). Thank you for all your visits and cheer, I’m really glad you’re part of my WP family. Have a super day!